Love Clock Live Wallpaper Love Clock Live Wallpaper is mostpowerful and great live wallpaper which make your mobile displaymore beautiful. Love Clock Live Wallpaper is contains with manybeautiful Love clock and you can customize clocks as per yourdisplay. Love Clock Live Wallpaper has lots of clock with suitablebackground and for set clock live wallpaper on screen you have tojust click on set wallpaper. 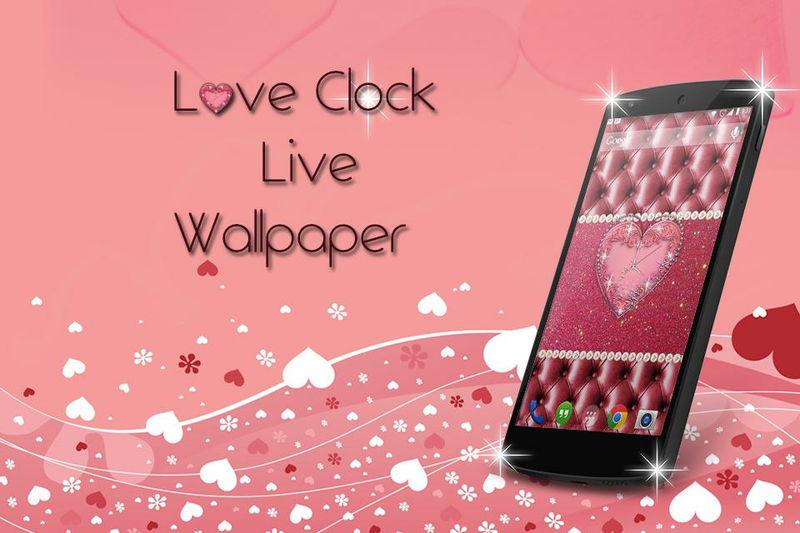 Love Clock Live Wallpaper contain manyoption for customize clock like select clock , clock size etc. MainFeature of Love Clock Live Wallpaper: 1) There are lots of clockavailable with hd backgrounds. 2) You can change clock size as peryour device screen. 3) Great user interface. 4) Completely freeapplication. How to set Love clock on screen: 1) Open the app andselect clock which you like most. 2) Customize the clock. 3) Set onwallpaper and enjoy the beautiful Love clock. Hope you all lovethis Love clock and you all set on your screen for see time andmake your screen more beautiful. Don't forgot to share our clockwith your family and friends and told them to use our applicationand set clock on than screen. If you love this Love clock livewallpaper than don't forgot to give good rating to us. Thank you!!! Flower Clock Live Wallpaper Flower Clock Live Wallpaper is mostpowerful and great live wallpaper which make your mobile displaymore beautiful. Flower Clock Live Wallpaper is contains with manybeautiful Flower clock and you can customize clocks as per yourdisplay. Flower Clock Live Wallpaper has lots of clock withsuitable background and for set clock live wallpaper on screen youhave to just click on set wallpaper. Flower Clock Live Wallpapercontain many option for customize clock like select clock , clocksize etc. Main Feature of Flower Clock Live Wallpaper: 1) There arelots of clock available with hd backgrounds. 2) You can changeclock size as per your device screen. 3) Great user interface. 4)Completely free application. How to set Flower clock on screen: 1)Open the app and select clock which you like most. 2) Customize theclock. 3) Set on wallpaper and enjoy the beautiful Flower clock.Hope you all love this Flower clock and you all set on your screenfor see time and make your screen more beautiful. Don't forgot toshare our clock with your family and friends and told them to useour application and set clock on than screen. If you love thisFlower clock live wallpaper than don't forgot to give good ratingto us. Thank you!!! Neon Flower Clock Live Wallpaper Neon Flower Clock Live Wallpaperis most powerful and great live wallpaper which make your mobiledisplay more beautiful. Neon Flower Clock Live Wallpaper iscontains with many beautiful Neon Flower Clock and you cancustomize clocks as per your display. Neon Flower Clock LiveWallpaper has lots of clock with suitable background and for setclock live wallpaper on screen you have to just click on setwallpaper. Neon Flower Clock Live Wallpaper contain many option forcustomize clock like select clock , clock size etc. Main Feature ofNeon Flower Clock Live Wallpaper: 1) There are lots of clockavailable with hd backgrounds. 2) You can change clock size as peryour device screen. 3) Great user interface. 4) Completely freeapplication. How to set Neon Flower Clock on screen: 1) Open theapp and select clock which you like most. 2) Customize the clock.3) Set on wallpaper and enjoy the beautiful Neon Flower Clock. Hopeyou all love this Neon Flower Clock and you all set on your screenfor see time and make your screen more beautiful. Don't forgot toshare our clock with your family and friends and told them to useour application and set clock on than screen. If you love this NeonFlower Clock live wallpaper than don't forgot to give good ratingto us. Thank you!!! Golden Rose Clock Live Wallpaper Golden Rose Clock Live Wallpaperis most powerful and great live wallpaper which make your mobiledisplay more beautiful. Golden Rose Clock Live Wallpaper iscontains with many beautiful Golden Rose clock and you cancustomize clocks as per your display. Golden Rose Clock LiveWallpaper has lots of clock with suitable background and for setclock live wallpaper on screen you have to just click on setwallpaper. Golden Rose Clock Live Wallpaper contain many option forcustomize clock like select clock , clock size etc. Main Feature ofGolden Rose Clock Live Wallpaper: 1) There are lots of clockavailable with hd backgrounds. 2) You can change clock size as peryour device screen. 3) Great user interface. 4) Completely freeapplication. How to set Golden Rose clock on screen: 1) Open theapp and select clock which you like most. 2) Customize the clock.3) Set on wallpaper and enjoy the beautiful Golden Rose clock. Hopeyou all love this Golden Rose clock and you all set on your screenfor see time and make your screen more beautiful. Don't forgot toshare our clock with your family and friends and told them to useour application and set clock on than screen. If you love thisGolden Rose clock live wallpaper than don't forgot to give goodrating to us. Thank you!!! Neon Clock Live Wallpaper Neon Clock Live Wallpaper is mostpowerful and great live wallpaper which make your mobile displaymore beautiful. Neon Clock Live Wallpaper is contains with manybeautiful Neon clock and you can customize clocks as per yourdisplay. Neon Clock Live Wallpaper has lots of clock with suitablebackground and for set clock live wallpaper on screen you have tojust click on set wallpaper. Neon Clock Live Wallpaper contain manyoption for customize clock like select clock , clock size etc. MainFeature of Neon Clock Live Wallpaper: 1) There are lots of clockavailable with hd backgrounds. 2) You can change clock size as peryour device screen. 3) Great user interface. 4) Completely freeapplication. How to set Neon clock on screen: 1) Open the app andselect clock which you like most. 2) Customize the clock. 3) Set onwallpaper and enjoy the beautiful Neon clock. Hope you all lovethis Neon clock and you all set on your screen for see time andmake your screen more beautiful. Don't forgot to share our clockwith your family and friends and told them to use our applicationand set clock on than screen. If you love this Neon clock livewallpaper than don't forgot to give good rating to us. Thank you!!! Pink Butterfly Clock Live WallpaperPink Butterfly Clock LiveWallpaper is most powerful and great live wallpaper which make yourmobile display more beautiful.Pink Butterfly Clock Live Wallpaperis contains with many beautiful Pink Butterfly clock and you cancustomize clocks as per your display.Pink Butterfly Clock LiveWallpaper has lots of clock with suitable background and for setclock live wallpaper on screen you have to just click on setwallpaper.Pink Butterfly Clock Live Wallpaper contain many optionfor customize clock like select clock , clock size etc.Main Featureof Pink Butterfly Clock Live Wallpaper:1) There are lots of clockavailable with hd backgrounds.2) You can change clock size as peryour device screen.3) Great user interface.4) Completely freeapplication.How to set Pink Butterfly clock on screen:1) Open theapp and select clock which you like most.2) Customize the clock.3)Set on wallpaper and enjoy the beautiful Pink Butterfly clock.Hopeyou all love this Pink Butterfly clock and you all set on yourscreen for see time and make your screen more beautiful.Don'tforgot to share our clock with your family and friends and toldthem to use our application and set clock on than screen.If youlove this Pink Butterfly clock live wallpaper than don't forgot togive good rating to us.Thank you!!! Red Analog Clock Live WallpaperRed Analog Clock Live Wallpaper ismost powerful and great live wallpaper which make your mobiledisplay more beautiful.Red Analog Clock Live Wallpaper is containswith many beautiful Red Analog clock and you can customize clocksas per your display.Red Analog Clock Live Wallpaper has lots ofclock with suitable background and for set clock live wallpaper onscreen you have to just click on set wallpaper.Red Analog ClockLive Wallpaper contain many option for customize clock like selectclock , clock size etc.Main Feature of Red Analog Clock LiveWallpaper:1) There are lots of clock available with hdbackgrounds.2) You can change clock size as per your devicescreen.3) Great user interface.4) Completely free application.Howto set Red Analog clock on screen:1) Open the app and select clockwhich you like most.2) Customize the clock.3) Set on wallpaper andenjoy the beautiful Red Analog clock.Hope you all love this RedAnalog clock and you all set on your screen for see time and makeyour screen more beautiful.Don't forgot to share our clock withyour family and friends and told them to use our application andset clock on than screen.If you love this Red Analog clock livewallpaper than don't forgot to give good rating to us.Thank you!!! Strawberry Clock Live Wallpaper Strawberry Clock Live Wallpaper ismost powerful and great live wallpaper which make your mobiledisplay more beautiful. Strawberry Clock Live Wallpaper is containswith many beautiful Strawberry clock and you can customize clocksas per your display. Strawberry Clock Live Wallpaper has lots ofclock with suitable background and for set clock live wallpaper onscreen you have to just click on set wallpaper. Strawberry ClockLive Wallpaper contain many option for customize clock like selectclock , clock size etc. Main Feature of Strawberry Clock LiveWallpaper: 1) There are lots of clock available with hdbackgrounds. 2) You can change clock size as per your devicescreen. 3) Great user interface. 4) Completely free application.How to set Strawberry clock on screen: 1) Open the app and selectclock which you like most. 2) Customize the clock. 3) Set onwallpaper and enjoy the beautiful Strawberry clock. Hope you alllove this Strawberry clock and you all set on your screen for seetime and make your screen more beautiful. Don't forgot to share ourclock with your family and friends and told them to use ourapplication and set clock on than screen. If you love thisStrawberry clock live wallpaper than don't forgot to give goodrating to us. Thank you!!! If you are a true fashion freak and you love to follow the latesttrends then get your own Live Clock Wallpaper! This is the newesttechnological innovation for your smartphone or tablet that willmake any mobile device a state of the art gadget. You'll find thatthis cool app for phones is very useful because the clock will bealways on display, but it is also a fantastic way to turn your oldhome screen background into a stylish live wallpaper. Browsethrough a huge set of trendy live backgrounds and urban skins foryour watch, designed carefully and with taste just for you! Makeyour favorite device one of a kind, download Live Clock Wallpaperfree of charge and have a new and different analog watch with amoving background every single day! Features: ✔ Check out all thewallpapers and backgrounds for your screen! ✔ Choose amongbeautiful live clock skins! ✔ Sync it with your digital watch! ✔ Ordesign your own “live clock”! ✔ Choose all the watch elementsseparately! ✔ Choose a background, hand, ticking and widget styles!✔ See the preview of each element combination! ✔ When you're done,sync the app with your device! ✔ Both round and square watchessupported! ✔ This is a real clock on display, not just a wallpaper!✔ Simple to use, easy to configure and great looks under yourfingertips! With your new phone personalization program go severalwatch skins and elegant live wallpapers that will make yoursmartphone or tablet a real treat for the eyes. Make your devicetrendy and stylish with this useful gadget and you'll soon findyourself wondering how you could live without it. In addition tomany “clock live wallpaper” styles created by our designers, thereare also many ways in which you can customize your own analog clockand design it according to your needs and desires. If you want a“clock on screen” and you like the idea of having a different watchface look every single day then get “Live Clock Wallpaper” for freeand have a trendy new watch on your display now! Download the“clock app” for home screen and design your own watch on display!With this free app you can build as many unique skins as you want!Moreover, the “always on display clock” will look much moreappealing if it is on a beautiful live wallpaper with a moderndesign. When you install the best app for phone customization youwon't be disappointed because it comes with a variety of beautifulbackgrounds and cool “clock themes” for the analog watch on yourdisplay. Modern clock design is fused with “old clock” style andthe result is an analog time teller that will make you say wow! GetLive Clock Wallpaper totally for free and feel the time passingsecond by second! Get rid of the old digital clock on your screenand get a live analog clock and wallpaper and enjoy its simplelook. This phone app lets you customize your tablet or smartphonewith different watch styles and great “wallpapers and backgrounds”.Decorate your mobile with sophisticated live wallpapers and add a“large clock display” that is both practical and stylish. Convinceyour friends to get the simple clock live wallpaper apk and syncwatches with them so you can be on time wherever you go. Whensomeone asks you what's the time, you can now proudly take out yourfavorite gadget and swipe everyone off their feet when they see theamazing watch face skins on stunning moving backgrounds. DownloadLive Clock Wallpaper free of charge and begin your day with asmile! Flower Clock live wallpaper in Analog Clock Live Wallpaper 2018: 3DClock Widget of vintage clock gear led clock is the Glorious Colorbest wallpaper its presents the good clock screensaver and wondrousdigital clock wallpaper. It shows the fascinating marvel watch gearof watch that is Flower Clock wallpaper hd best attraction for aCharming tender analog Clock wallpapers live clock wallpaper. Thislive Clock wallpaper has the feature of digital compass sensor appand flower digital clock hd Luxury clock live wallpaper. Daisyflower clock compass app pro is also vintage live wallpaper 3d isthe Flower Clock hd live wallpaper clock live wallpaper and USFlower Clock and pretty icon live hd wallpaper. Flower Clockanalog clock live wallpaper is a sensational providing you to findout the north and south directions of this gold clock 2018 and freeanimated treasure wallpaper and marvel watch. This done because ofcool Russia clock wallpaper and vintage timepiece compass liveclock wallpaper app and wallpaper for mobiles and best Indian Goldclock live wallpaper beautiful flower best flower fashion app. Thisanalog clock wallpaper is having the calendar, date and time in thedigital live wallpaper best clock screen saver samsung application.This US Flower Clock 2018 analog wallpaper has the best soundeffects of tik tok, ticktock, tiktak, ticktick and 4 retro digitalclock widget. This is the best art graphics live clock wallpaper 3dwidget of clock screen is the best cool phone wallpaper beautifulmoving wallpaper stopwatch. This Unique analog clock live wallpaperis beautiful best clock of Golden phone backgrounds in vintageanalog clock gear 3d, live clock wallpaper is the live wallpaper isthe live 3d gear clock wallpaper of live clock wallpaper flowerscreen lock. You decorate your screen with yummy flowers to updateyou background your phone with best Flower live wallpaper andIndian Flower live wallpaper and US Flower live wallpaper and bestflowering app. Nice Clock Analog Clock Live Wallpaper 2018: 3DClock is best free wallpaper and free live wallpaper. This liveclock wallpaper is great app to decorate your Smartphone BestAndroid Live wallpaper. This is the best way to express the timeand date from your More Free wallpapers analog clock wallpaper.Amazing HD screen shots that show you how this analog clockwallpaper your smart phone. This analog live clock wallpaper is thevintage analog wallpaper and free wallpapers and HD backgrounds.This is the Rose Golden best live clock wallpaper and good timingapp as Christmas countdown. This Butterfly clock analog clock livewallpaper in solid and gradient style. Luxury Watch live wallpaperand Rose Backgrounds. You have the custom calendar, current dateand time. This military vintage analog clock wallpaper 3d clockhave the long touch, alarm and clock amazing wallpaper and chronusand HD graphics Samsung S4, S3 and S5 and galaxy S8 notewallpaper. Flower Clock Analog Clock Live Wallpaper 2018: 3DClock is the best Live clock wallpaper and Free live clock livewallpaper and analog clock live wallpaper and charming flowerpattern. This unique hd live wallpaper have the wallpaper Rosephoto and Nice Clock background and hd graphics. You have thefabulous analog live wallpaper and best digital clock wallpaper andwatch wallpaper and free screen saver this is the best wallpaperfree and live wallpaper apps and backgrounds of 3d wallpaper andromantic live wallpaper HD klocki. This Flower live Wallpaper isthe most beautiful Android live wallpaper this live wallpaper isexpress that the nationality of Pakistan. This luxury watch analogclock live wallpaper and luxury watch background. We are proudly presenting the most gorgeous "Digital Clock LiveWallpaper". Just look at the beautiful and elegant design of thisdigital clock... It creates a wonderful atmosphere able to make youstare and contemplate your screen at infinity. The digital clocklive background comes with a set of HD 4k wallpapers carefullychosen pictures from tranquil nature landscapes. You will have adigital time widget and a blurred nature scenery forming anastonishing space-time combination. Even if it is a free livewallpaper, the clock comes in a form of a "clock widgets for homescreen" because you can set its position and also its size from thesettings menu. It will run smoothly and will bring you thatstupefying feeling of relaxing time passing by. You can adjust theclock format by choosing the 24h format or the 12h format. We keptthe "clock live wallpaper" design as simple and elegant as possiblein order to not stress out your home screen with unnecessary stuffthat you will never use. And the result is what you see... amarvelous digital clock with an absurdly wonderful elegance. Startusing the "digital clock" as your clock widget for the home screen.It will indicate time of the day, date of the month, day of weekthus working as a mini-calendar on your clock home screen. You willbe able also to change the text color of the digital clock byrealizing in this way your personal clock design. The clock designcan be completed by choosing the perfect position of the clockwidget on your screen and the size of the digital clock app fromsettings. All the images chosen are captured during warm weatherconditions so it realizes the perfect combination clock-weather.The HD clock Live Wallpaper works enchantingly also on tablets andit was adapted to be a gorgeous clock live wallpaper for tabletstoo. Try "digital clock screensaver" now and you will have theprettiest clock art creation of all times. It will be the cutestclock theme you have ever had. Among our apps you can also find theanalog clock live wallpaper for an outstanding experience withanalog clocks too. Stylish live clock for stylish people! Get an amazing wallpaperthat shows a clock in real time on your smartphone display. ClockWallpapers Real Time is a cool app for everyone who want to beinformed about the exact date and time and their battery powerwhenever they unlock their tablet or phone. Modern and stylishdesign of the clock faces will suit any mobile device. Know exacttime at any moment and feel sophisticated wherever you go becauseyour one of a kind smartphone with a cool live wallpaper is alwaysat your side. This is the best decision for those who likeusability and if you feel like one of them then download ClockWallpapers Real Time free of charge and show the world youruniqueness! Features: ● Choose among cool watch skins and sync themwith your watch! ● Or design your own “live clock”! ● Choose all ofthe elements separately! ● Choose a background, different handstyles, markers and widget styles! ● See the preview of eachelement combination! ● When you're done, the watch app willautomatically sync with your device! ● This is a real watch on yourhome screen background, not just a wallpaper! ● Beautiful livewallpaper clock with date and time for free! Original “analogclock” with beautiful combination of sophisticated colors willbecome a wonderful decoration of any mobile device. A wide range ofmoving backgrounds with beautifully designed clock hands willexcite you and prepare you for every day challenges. Without anydoubt, this is one of the best “clock live wallpaper” hd you canfind on the market and it is both very functional and attractive.Choose among several predefined “clock themes” that our designershave prepared for you or create your own live wallpaper byselecting all the elements separately. If the most importantfunction of your live wallpaper is showing time and date thendownload Clock Wallpapers Real Time free of charge and be on timewherever you go! These original moving wallpapers will surely bringluck and success to you because you'll feel more daring andconfident knowing that the “best live clock” wallpaper is by yourside. Elegant and “always on display clock” will decorate the homescreen the way you've always wanted, plus it will save your batterylife. In our app for phones and tablets there are several greathome screen themes that not only “display clock on screen” but alsoshow date and your battery power. You can also make your own “livewatch wallpaper” with an analog clock of unique design and show theworld how special you are. If you are bored with a simple digitalwatch on your screen then it is time for a change. Download ClockWallpapers Real Time for free and feel urbane every day! Give atouch of elegancy to you ordinary screen background and add astylish watch! This app for phone personalization is actually amoving picture because it represents a real watch on displayshowing real time. This fantastic “watch wallpaper” does not takeup much space on the screen and yet it is perfectly visible and hasa large clock display so you will be easily updated about thecurrent time and date. Sophisticated images of the latest and newlive clocks make this cool app out of this world. Various watchelements which you can use to make your own live clock wallpaperare carefully chosen by our designers so you can customize yourphone or tablet to your liking, or select one of the predefinedthemes. Download “Clock Wallpapers Real Time” and spice up yourlife with these amazing clock skins for free! If you wanna find out why diamonds are a girl's best friend theninstall Gold Diamond Clock! The latest clock app will make yourmobile device both functional and beautiful with various movingbackgrounds. Check out all luxurious themes and find the one thatthat suits you most! You can also choose a simple clock face or anelegant one and change the background in the matter of seconds tosuit the occasion you're in. This live background time teller canbe your perfect fashion accessory since you'll have the goldenclock studded with diamonds! Waste no more money on expensivejewelry, get this background clock for free! Download Gold DiamondClock and make your phone glitter every day! Features: ⌚ Check outall wallpapers and style your home screen background! ⌛ Chooseamong beautiful clock skins or create your own live clock! ⌚Optimized battery usage! ⌛ Choose a background, hands, markers andwidget styles! ⌚ See the preview of each element combination! ⌛This is a real clock on display, not just a wallpaper! ⌚ Choose allthe clock elements separately! ⌛ Completely free live wallpapersand backgrounds for your screen, compatible with 99% mobiledevices! ⌚ Get this clock live wallpaper free of charge andembellish your phone! You can stop searching for the perfect "clockbackground" because you've finally found it! With this "luxuryclock live wallpaper" you'll always have a beautiful background andyou'll never be late again! Gold and "diamond themes" will addstyle to your mobile device and make it trendy. This luxurious andrich wallpaper clock is made for successful people! Glam up yourphone screen and let it be your perfect fashion accessory! You willbe amazed with the fact that this free clock app shows time, dateand battery power at the same time on your home screen and it hasexclusive backgrounds that will make your phone or tablet elegantand distinctive. Don't hesitate, download Gold Diamond Clock andadorn your mobile device! This "live wallpaper clock with date andtime" is both nifty and functional! There's a bunch of "beautifulmoving backgrounds" that you can choose. Find your favoritewallpaper and combine it with a clock widget, the result will bewonderful! These clock themes are the perfect combination of"diamonds and gold"! With them, your screen will never be the sameagain! Besides, you can choose your favorite clock face andpersonalize it to suit your needs and style perfectly. Feel likeyou have a real diamond phone or golden clock on your home screen!Download this unique collection of "glitter wallpapers andbackgrounds" and never change it again! Gold Diamond Clock isavailable for free so glam up your phone right away! It's high timeyou changed your old background! Style has nothing to do withmoney, so get these gold diamond wallpapers for free and show yourtaste! The dazzling beauty of these precious gemstones will enchantyou and turn your screen into a piece of art. You can alsocustomize it with various "moving backgrounds" and diamond &gold themes so it can suit your needs and style perfectly! From nowon, if you're wearing a diamond jewelry your phone or tablet can bethe perfect addition to your style! These live backgrounds willreflect your inner beauty and never let you down in decorating yourfavorite mobile device. Transform your phone display into anextravagant gadget with this "analog clock wallpaper"! Download"Gold Diamond Clock" and style your phone! "DIGI Clock Widget" is free set of five highly customizable digitaltime and date widgets:2x1 widget - small4x1 widget - wideoptionally with seconds 4x2 widget - big5x2 widget - for tabletsand especially for Galaxy Note6x3 widget - for tablets.Featureslots of customizations, like:- widget preview during setup- selectwidget click actions: tap on widget to load alarm application,widget settings or any installed application- allows you selectyour preferred colors for time and date- shadow effect withselectable color- outlines- locale preference, set date output inyour language- plenty of date formats + customizable date format-show/hide AM-PM- 12/24 hour selection- alarm icon- show time withseconds option (for 4x1 widget)- widget background with selectablecolor and opacity from 0% (transparent) to 100% (completelyopaque)- use picture as widget background- 40 great fonts for timeand date ...- ... or use your favorite font saved on memory card-ready for Honeycomb, ICS, Jelly Bean and Lollipop Android versions-recommended for tablets- lock screen widget for Android Jelly Bean4.2+... and even more ...Problems with installation?This is homescreen widget and not the application, please read the instructionson how to use the widget:Older phones (before Android 4.0 ICS) andAndroid 4.4 KitKat:• To add a widget, touch and hold an emptylocation on a home-screen. Menu will pop-up, select Widgets.•"Choose Widget" menu will popup. From there, find and select "DIGIClock" widget of desired size.Newer phones and tablets, Android 4.0and later (Ice Cream Sandwich, Jelly Bean):• Touch the All Appsicon on your Home screen.• Click “Widgets” tab at the top of thescreen.• From the main Widgets screen, you can swipe left until youfind "DIGI Clock”• Touch and hold the desired widget’s icon, slideyour finger where you want to place it, and lift your finger.Ifthere are missing "DIGI Clock" in list of widgets, try to restartphone, it might help.To add the widget to your Android 4.2+device's lock screen, simply swipe to the left-most page of yourlock screen and touch the big "+" icon. Then, select "DIGI Clock"add the widget. You can make this the primary lock screen widget,replacing the default clock, by first touching-and-holding it andthen dragging it horizontally to the very rightmostposition.NOTICEDo NOT move this app to SD-card! Widgets won't workonce you move them to SD card.Please exclude this widget from anytask killers, this will resolve the time freezing issue in mostinstances.When you want help us with localization of "DIGI ClockWidget" to your language, visit please thissite:https://crowdin.net/project/digi-clock-widgetThanks for usingDIGI Clock Widget! 🕖 Our new "live clock app" is pure gold! Hurry up and see foryourself! Gold Clock Live Wallpaper App: Analog Clock Widget allowsyou to have an elegant and stylish phone screen, at the same timefully equiped to meet all your needs! It will help you keep trackof time in the most sophisticated and classy way with gold-plated"clock screensaver" designs and shiny backgrounds. Select one ofour gorgeous gold "analog watch" themes and set it on your homescreen instead of the same dull "digital clock" widget thateveryone has! These analog clock "live wallpapers" with backgroundscovered in gold will embellish your display and show you the exacttime and date always! Golden screen "clock widget" for Android™phones and tablets is not only beautiful to look at, but actuallyvery useful! Get this amazing "clock app" completely free of chargeand discover your pot of gold at the end of the rainbow! Downloadthe stylish "Gold Clock Live Wallpaper App: Analog Clock Widget"now and customize your phone with "live clock wallpaper formobile"! Features: ⌛ A real clock-on-screen gadget that shows theexact time and date - not just a wallpaper! ⌛ Beautiful "clockskins" with gold backgrounds! ⌛ Cool "animated wallpapers" and livebackgrounds for your "screen clock"! ⌛ Design your own analog clockby choosing each of the elements separately! ⌛ Choose a clockbackground theme, shape of hands, manner of ticking, widget style!⌛ See the preview of each element combination! ⌛ When you're done,sync the clock app with your device! ⌛ Both round and square watchdesigns supported! ⌛ Simple to use, easy to configure, modern andsophisticated! 🕖 Time is on your side! If you have a problem withtime management, our fancy gold clock backgrounds and livewallpapers will make sure that you always arrive on time! Decorateyour mobile device and personalize your phone with our amazing"always on display clock" widget! If you like cool gadgets, youwill adore this beautiful analog watch and HD "clock wallpapers",because they display time in a rather unique way! Refresh yourdisplay with a rose gold theme or choose one with yellow golddetails engraved on it. Get Gold Clock Live Wallpaper App: AnalogClock Widget and let the gold fever begin! It is high time youchanged your phone lock screen wallpaper! 🕖 Forget about digitalwatches! This old school yet modern time teller with elegant golddesign will be a perfect substitute for your default digital clockapp! We offer a variety of moving backgrounds and "home screenwallpapers" of gold for all tastes! Within our innovative screenclock app you'll find a large number of analog watch animatedbackgrounds to personalize your display and make it original! Setan always on display clock instead of useless ordinary wallpaperbackgrounds. You'll see the difference immediatelly! 🕖 Check outour state-of-the-art clock widget with gorgeous animated wallpaperbackground clock scrensavers! These watch widget will give apersonal touch to your display and help you keep up in the raceagainst time! Get this magnificent watch and you will never be latefor an important meeting or event ever again! Show your new fancyclock app with one-of-a-kind live wallpapers and moving backgroundsto all your frends! They will be thrilled by this sophisticatedscreen clock! 🕖 The time is now! Hurry up! Get the best "screenclock" app totally free of charge and customize your phone with amodern watch design! Glittery backgrounds with a variety of detailspainted in gold and a clock screensaver are waiting for you. Makeevery moment count, because time flies! Our gold clock wallpaperapp has set a gold standard among similar clock widgets on themarket, so why wait? Take this golden opportunity, download itright now and enojoy! * This app is ad – supported. Clock Live Wallpaper - A beautiful analog clock for your display. Awatch live wallpaper that comes with an analog clock, a batterylevel indicator and a calendar date with day of week. In thisanalog watch you have many options for customizing. Analog clocklive wallpaper comes as a clock battery widget for home screen.Among all clocks for Android, our free clock widget for Androidgives you the ability to contemplate the clock time lock screen andthe battery level indicator. This clock theme for Android will showthe clock time zone. By installing it you will have the clock onscreen, clock on lockscreen, clock on sleepscreen, clock onhomescreen. Through this clock app you will beautify your phonewith a clock screensaver and a clock screen lock. Display clock onmain screen with this clock for lock screen and clock for homescreen app. The clock for Android that you were searching is a tapaway. Start playing with the settings of this clock game and makeit your clock home screen. A set of clock hd wallpapers come as afree pack for this clock live wallpaper for lock screen. We triedthis clock live wallpaper hd app clock xperia, clock xiaomi andmany other phones. We designed it as a vintage clock and added acalendar to form a clock calendar widget. Analog clock livewallpaper is the cool clock live wallpaper that comes as a minimalclock widget. The clock vidget is tested and adapted to work as agalaxy s8 clock and it is the best s8 clock you ever had. Features:- Analog Clock Live Wallpaper - Clock display on main screen -Battery drain analyzer widget - Battery percentage - Calendarwidget - Clock theme for android - Clock battery widget - Screenadapted for tablets and phones Enjoy this free app.